I wasn’t necessarily expecting to be enlightened by observing a class of ten-year-olds participating in WMEAC’s Teach for the Watershed program, but I was wrong. When a young girl, a fifth-grade student at West Ottawa, confessed the nickname for the over-polluted Lake Macatawa was, nobody snickered. She spoke shyly, “Lake Maca-toilet.” I had never heard the nickname “Lake Maca-toilet” before that morning. The fifth-graders knowing that nickname and more importantly knowing that it is not something to giggle at gave me a sense of hope. Perhaps I was expecting all fifth-graders to be like me. I remember being restless, raucous, and uninterested—but uninterested they were not. They listened with interest to the entirety of the lesson on watersheds, raised their hands to answer and ask questions, and seemed to gain an understanding of the complicated concepts of pollution in their hometown watershed. The experience gave me hope that the future of our environment would be in caring and conscientious hands. Then I got thinking about how much has changed in how we educate the youth today. Little more than a decade ago I was a fifth-grader, who didn’t seem to think much about the environment. Environmentalism is a practice not much more than half a century old, so I grew curious as to how it has been incorporated into the sometimes-impermeable public school curriculum. “Go back to Earth Day 1970. I think that’s really what got the ball rolling. That was the same year the EPA was established too. That’s when people started paying attention,” said Dr. Janet Vail, Grand Valley State University research scientist, and educator. To give you a sense of who Dr. Vail is and just how she has been affecting world of environmental education, she is one of only a handful of professors at GVSU who actually has her own, designated classroom, which she has vibrantly decorated with fish tanks, stuffed birds, and other bits and pieces of nature. She has been doing work in this discipline for decades and quite literally wrote much of the curriculum for environmental education in West Michigan. “I grew up in West Michigan,” Vail said. “I went to Grand Rapids Public Schools, and the only science we had was once a year when Mary Jane Dockeray came to school.” This was obviously before WMEAC helped put in place our educational Teach for the Watershed program which spans all of Grand Rapids Public Schools. Dr. Mary Jane Dockeray is fondly known as the godmother of environmental education in West Michigan. She grew up in the area and was always passionate about nature, spending her childhood exploring the forests in the area. In the mid-1960s, Dr. Dockeray founded the Blandford Nature Center—a place for people to admire the outdoors as well as a medium for students to come and learn about nature. Dockeray predated environmentalism as simply nature education, but this planted the seeds that would eventually blossom into environmental education. Dockeray is well into her eighties now, but still frequents the Nature Center and gives presentations. The seeds had been sown, but a true environmental curriculum did not start to emerge until the early 1990s. 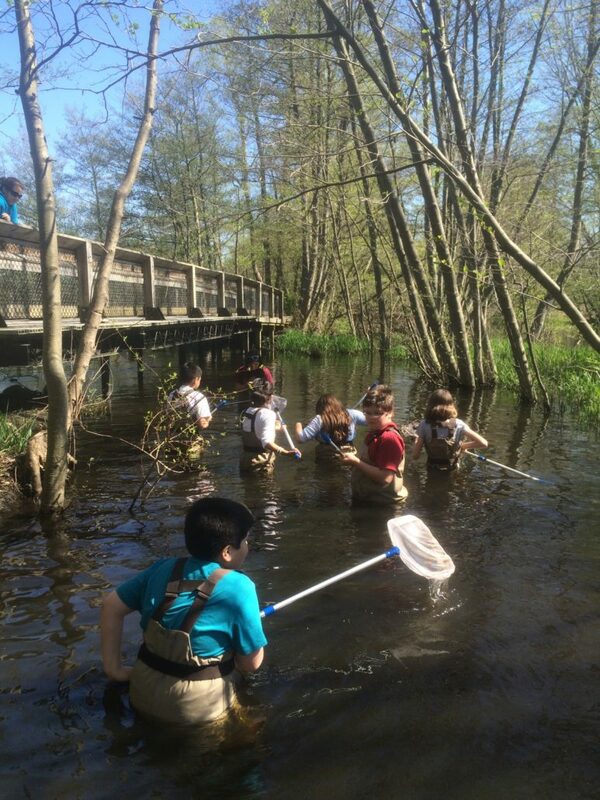 The Michigan Alliance for Environmental and Outdoor Education (MAEOE) was founded in 1990, and focused on connecting all different aspects of nature and environmental education—from educators to nature centers, zoos, parks and more. MAEOE became the foundation for Michigan’s environmental curriculum movement. This is where Dr. Vail became a very important player. She is a co-writer, coordinator, or facilitator of most of the published environmental curriculum over the past twenty years. Her work includes some of the most well-respected educational publications but is certainly not limited to: Project Learning Tree, Project WET (Water Education for Teachers), Earth Partnership for Schools, and the Michigan Environmental Education Curriculum Support (MEECS). Jessica Wagenmaker has been teaching science to middle school students for twenty-three years in Holton Public Schools. About ten years ago she accepted the opportunity to be a pilot teacher for MEECS, which is essentially a program that that teaches the teachers about environmental education and helps to make lessons more approachable through their required curriculum targets. She then became a facilitator in the program and has workshopped over 1,000 teachers in the past decade, who have gone on to reach thousands of students. As I mentioned earlier, I was not always the most cooperative or attentive student, so I was curious about the attitudes of middle school students towards environmentalism. Wagenmaker has learned to keep things fun and approachable for her students, by developing practical programs like “Up-cycling”. This is a class that meets every day, and all they do is take other peoples’ trash and make it into something useful. They’ve made things like rugs out of old t-shirts, artwork with wine corks, and scarves out of men’s old button-ups. It teaches students about practicality and gives them something tangible to understand the concept of reducing waste. It also teaches teambuilding, economics, and artistic ingenuity. There are seventy to eighty students in each graduating class in Holton Public Schools. Wagenmaker teaches every single seventh and eighth-grader in the district, and she believes that if she can convince just one or two of those kids to make a change, that is an awesome percentage. Wagenmaker was given the 2016 ‘Educator of the Year’ award WMEAC’s annual meeting for all the work she has done in changing the environmental education landscape throughout the years. As time goes on and environmental issues become more pertinent and more prevalent, it is becoming necessary for our educators and communities to prepare our youth for the future with programs like Teach for the Watershed and our new program Zero Waste in Landfill. With trailblazers and innovators like Dr. Mary Jane Dockeray, Dr. Janet Vail, and Jessica Wagenmaker guiding the youth, our youth to become stewards of the Earth, the future may yet be in good hands.